Okay, so here’s a route I don’t go very often in my blog. Generally, in these posts, I am free to write what I want, about who I want and rule with an iron glove, but not right now. It goes back to a post I did a bunch of months back around the time that the Cubs were about to win the World Series for the first time in a century and Hillary was making a bid for the presidency. I had tried to explain to my eldest that she may be asked some day where she was when the Cubbies went from lovable losers to world champs. I was rebuffed by her as she explained that we may have our first woman president. I relented and downgraded the importance people put on sports. I had even discussed it with my good friend David Bruning, begging the case that people are too reliant on professional athlete’s achievements and not enough on their own or their kids. I believe I may have stood on a small soapbox discussing my running and my golf and the girls and their soccer meaning more to me than something I watched on TV. 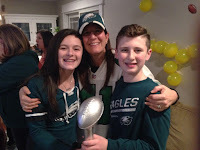 Last Sunday the Philadelphia Eagles defeated the New England Patriots in the Super Bowl. 98% of the country were Eagles fans that day and the other 2% are made up of people unable to correctly say ‘chowder’. I literally did not speak to a single person cheering for the Pats in the weeks building up to the big game. Now, my brother being a huge Dallas honk living in the greater Philadelphia area may have internalized a secret Tom Brady crush last week but we didn’t discuss it. 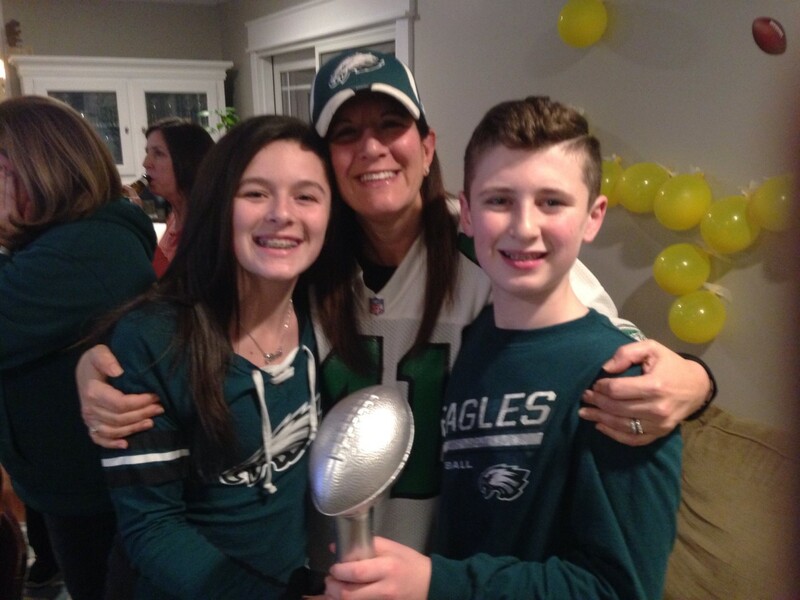 Among the 290 million Eagles fans last weekend was my sister-in-law Lisa. She has been a long-suffering fan of the ‘Birds’ like her father before her. Her dad, Big Al, passed away a couple of years ago and the world is worse for it. Big Al was a larger than life character and lived life the way most of us should. He lived it on his own terms and with a confidence seldom seen outside of a pro wrestling ring. He loved his family dearly and treated them like gold, including his Dallas Cowboy loving son-in-law. On Big Al’s shoulder was a tattoo. It depicted his life’s true loves. It bore his girlfriend’s initials, a beach chair and the logo for the Philadelphia Eagles. He was literally one of my favorite people I’ve met on God’s green earth. He loved Philadelphia sports in general, but the Eagles held a special place in his heart. As luck goes, Al was alive to see the Eagles lose to the Patriots in the Super Bowl a few years back but didn’t quite make it to Sunday’s game. I like to think he was sitting in a beach chair somewhere, drink in hand, looking after the team. But this post isn’t about Big Al, not by himself, it’s about the ties that sports can bring. While I’m sure not every thought going through my sister-in-law’s mind was about her dad, some certainly were. Judging by the texts I received that included “he would be losing his mind” or the fact that she was wearing Al’s hat during the game (and a Keith Byers jersey for some reason), Big Al was there. The game brought comfort to Lisa knowing that somewhere Big Al was smiling. That is what sports can do. Sports can unite people. It can help people with find common ground and distract them in times of trouble. And not just sports. For my sister and myself, it’s going to comedy shows. For my wife and me it’s the Walking Dead. With my Mom it’s reading the same good book. But for my brother and me it’s football, fantasy or otherwise. So, here’s the thing girls. I was wrong. Sports can be important. Not just the ones you play, but the ones you see on TV or the ones you buy a ticket for. It’s about connections and memories. I will always remember where I was when the Cubs won the world series but not nearly as clearly as the time I missed the Raiders/ Redskins Super Bowl because my dad was pulled over TWICE in his hurry to get home to watch. At the time, not funny, now, much different. I’ll remember taking Avery to a Rockies game, not because of the game itself but because of her effort in eating everything Coors Field had to offer. I’ll remember a Rockies game from a couple of years ago, not because the Rockies did well, but because my entire family went, niece and nephew and all, and the fact that Macy got on the Jumbo-Tron during the game. The games are fun, but the family parts are bigger. Girls, even when your sixteen and your old man is so uncool you don’t want to be seen with him, give him and afternoon here and there and catch a game. He’ll love it.